Many families face financial stress. According to USA Today, The majority of Americans are not setting aside enough money in emergency savings to cover a significant unexpected expense, according to a new survey from CIT Bank. That’s a problem, because nearly half of American households were faced with emergency expenses in the past year. 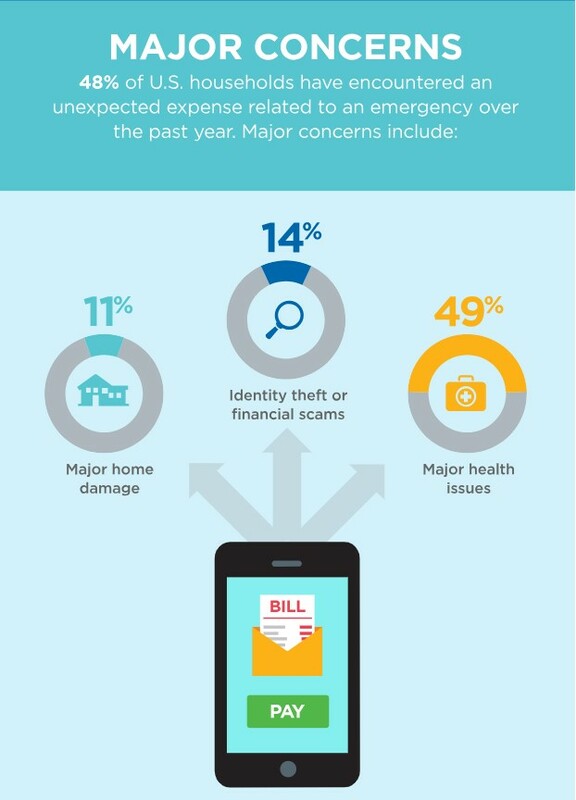 “More than one in four U.S. consumers do not save for unexpected events such as a home repair or health expense,” said Ravi Kumar, head of Internet Banking for CIT Bank in a press release. Experts generally recommended that your emergency fund be large enough to cover three to six months of your household expenses, but those numbers aren’t set in stone. If you have a job where your income is not stable, for example, or a health insurance plan with a high deductible, it might make sense to have an even larger cushion. But as numerous other studies have confirmed, the failure to save steadily has left a large majority of Americans far shy of those targets. Earlier this year, just 39 percent of respondents to a Bankrate.com survey said they had savings sufficient to cover a $1,000 surprise expense. And that leaves people in a tough position when trouble arises. “Family and credit cards top the list of resources Americans rely on for financial support instead of utilizing a savings account for emergencies,” Kumar said. Those may not be the most appealing options so some consumers turn to other options, like their retirement accounts. CBS News reports, “About half of 401(k) plans allow participants to borrow against their account, and about 25 percent of participants have an outstanding loan. Those who do borrow from their account see it as a good way to get to their money in a hurry. But 401(k) loans have a dark side: They’re habit forming and can make you poorer. When offered two loans, nearly 15 percent of participants take advantage of that. When offered three or more loans, about 12 percent of participants take them. But workers who take loans from their 401(k) save less (6.7 percent) than participants with no loans (8.3 percent). Workers who don’t take loans are projected to save up to $749,000 by retirement age, whereas those with loans are on track to save about $100,000 less. According to MarketWatch.com, a new solution may soon be available. “A growing number of employers, benefit-plan sponsors, policy analysts and members of Congress are taking steps to correct the long-standing problem. The goal is creating a new type of emergency-savings plan for workers that is offered through employers. …according to Newark, N.J.-based Prudential, 12 million Americans take out payday loans annually, incurring $9 billion in fees. “So many people don’t have the capacity to address a financial emergency, so their 401(k) is the only pot of money they can tap into,” said Rachel Weker, vice president of T. Rowe Price Group’s retirement division in Baltimore. But exactly how employers can offer rainy-day savings is murky and presents a number of obstacles — legal, administrative and behavioral. Nevertheless, a few pioneering employers and financial-services firms are testing out alternatives. “Employers are still trying to sort out ways to do it, figuring out what are the pluses and minuses, the legal issues and the costs,” said Brigitte Madrian, the Aetna professor of public policy and corporate management at the John F. Kennedy School of Government at Harvard University in Cambridge, Mass. 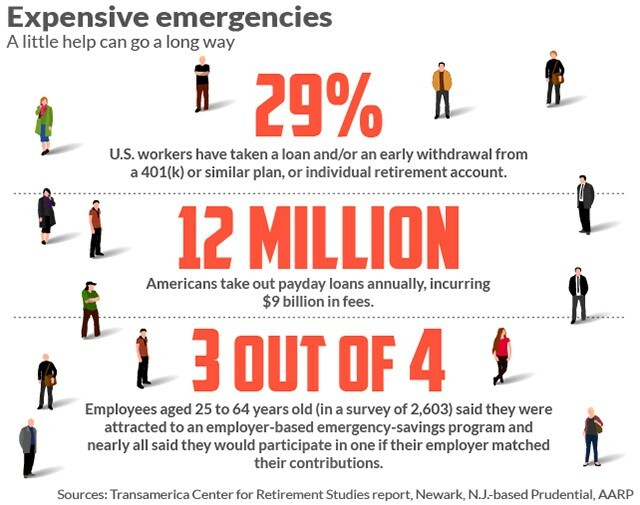 There are two main types of emergency-savings plans offered through employers: so-called sidecar or rainy-day accounts, which are adjuncts to retirement-savings plans such as 401(k)s; and do-it-yourself arrangements that employees set up with subsidies from employers. Prudential Financial (NYSE: PRU) and Prosperity Now, a research and public-policy nonprofit, teamed up recently to help employers set up sidecar accounts, alongside the firms’ 401(k) retirement-savings plans. This could provide an investment opportunity for long term investors. In a sidecar account, an employee uses after-tax money (as opposed to the pretax money allocated to a retirement plan). Once the cash builds up to a predetermined level, future payroll deductions go into the retirement account. If the emergency-savings account drops below its intended target, money from the employee’s retirement fund is transferred in. Sidecars are funded with after-tax money because the Employee Retirement Income Security Act of 1974 law, known as ERISA, doesn’t specifically allow pretax saving through employers; investment earnings are taxed when withdrawn. Current law doesn’t allow auto-enrollment for sidecar accounts, either. “Companies are understandably risk-averse when it comes to complying with ERISA,” said David Mitchell, associate director for policy and market solutions with the Aspen Institute Financial Security Program in Washington, D.C.
A bipartisan Senate bill, the Strengthening Financial Security Through Short-Term Savings Accounts Act of 2018, aims to rectify those drawbacks, letting employers automatically enroll workers in easily accessible stand-alone accounts or sidecar accounts. The bill would also see the Treasury Department create a pilot program that offers incentives to employers to set up short-term savings accounts. Companies could put $400 into each employee’s account. The legislation appears unlikely to pass in 2018 because time is running out. But, these funds could soon be available, and PRU could gain billions in revenue as the accounts become available.